If you are looking for a pasta dish that is fresh, delicious and perfect for the hot days of summer this is it. Summer bolognese is a lighter version of the classic tomato laden bolognese sauce popular throughout the US. It's a no-fuss pasta dish that features fresh tomatoes, basil and kalamata olives along with sausage and pecorino cheese. Cook the pasta in a large pot of salted boiling water for 10–12 minutes or until al dente. In the meantime heat olive oil in a large, skillet over high heat. Add the garlic, sausage and crushed red pepper flakes. Cook, for 6–8 minutes or until sausage is browned breaking up large pieces with a wooden spoon. Add the tomato paste and cook for 4–5 minutes. Add the wine and vinegar and cook, stirring occasionally, until the liquid is reduced slightly. Add the tomatoes and olives. Pour sauce over pasta and toss to combine. Top with fresh basil and sprinkle with pecorino cheese to serve. Pasta ia always a favorite around here! love the idea of using the sausage. This looks perfectly light and flavorful for summer! YUM! Yum! Love the fresh tomatoes! This looks and sounds deeeeeeeeeeelish! I don't want summer to end!!! Looks like a delicious meal that won't weigh me down! YUM! I love light pasta dishes for the summer! This looks great. Total comfort food! This looks so good, especially with those beautiful olives and pecorino cheese. I'm totally down for a summer bolognese, sounds like a tasty meal! Love this!! I have been eating this so much this summer. Love the fresh cherry tomatoes..
Angel pasta is my favorite, and I love your recipe! Thanks for sharing! Yumm! As a true italian, I could totally dive into this pasta straight away! What a great idea---bolognese is one of my favorite comfort foods! Such a perfectly delicious combination of ingredients! Oh yum, I love how light this sounds! My kids love bolognese but I never want to make it during summer as it just seems to heavy for the weather - this is the perfect alternative!! Oh my gosh just reading through your ingredients list was enough to make my mouth water. 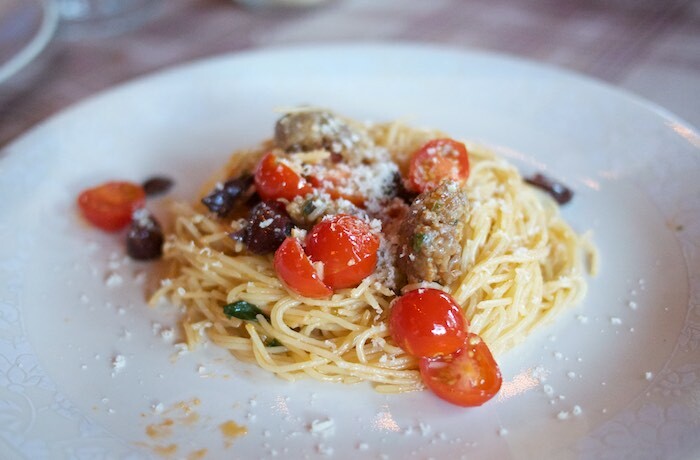 Love Italian sausage in bolognese but especially with a good sprinkling of pepper flakes. Plus I can just imagine the little burst of sweetness from the cherry tomatoes. Yum! I am loving this lighter take on the bolognese - perfect for the summer months! I love using fresh tomatoes to make a pasta sauce. The addition of olives is so good. Very similar to a sauce we like to whip up for dinner. Delicious!! Such a lovely pasta recipe. It sounds delicious and I love the olives in it. All of my favorites in this light and lovely pasta recipe! Yummy! This looks so fresh and light, I could eat this all day long. Such a great spin on traditional bolognese.